The trails in this area are looped and offer some beginner trails in the lower elevations with more challenging ones higher up. It is a great area to ride as there are flat cross country trails, single track trails along with ones that challenge the rider with steep difficult climbs and fast flowy descents. Some of the trails have drops, ladders and rocky stunts along the way along. The trails can be loose in the summer months but are fairly compact with little erosion and are marked by usage rather than signage. 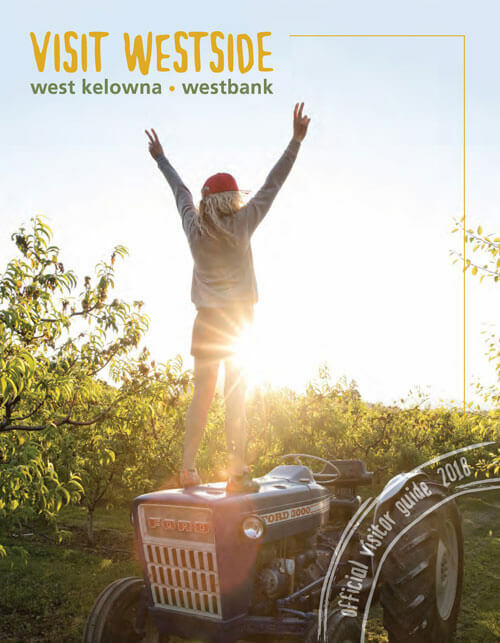 Climbs to the top are rewarded with views overlooking West Kelowna. As it is a mix trail use area, please be aware of hikers and horseback riders in the area. 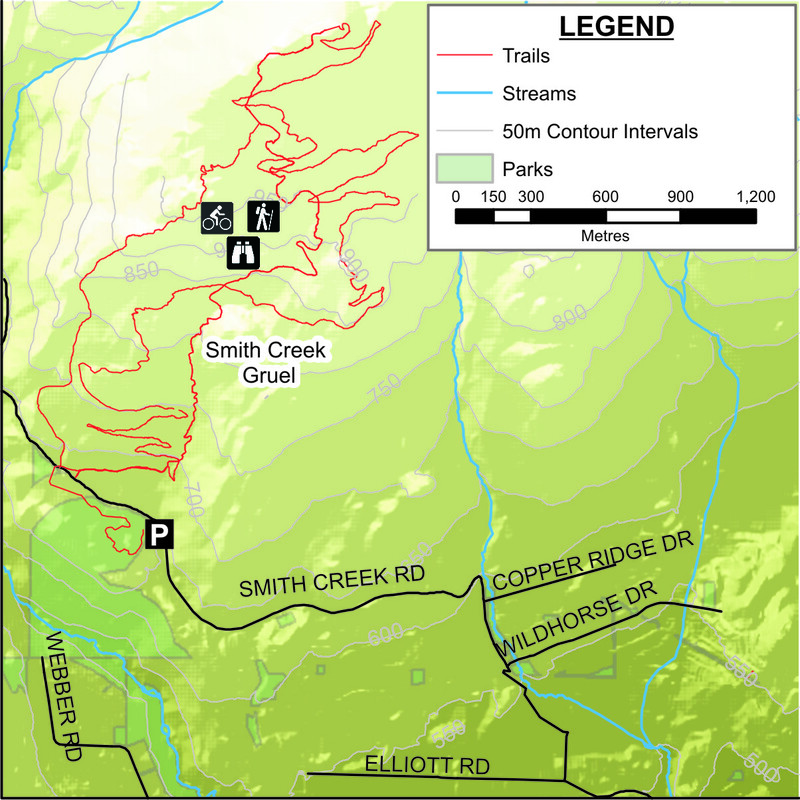 The Smith Creek Gruel is an easy trail to access as the trail head is just a few minutes from the main highway by car. 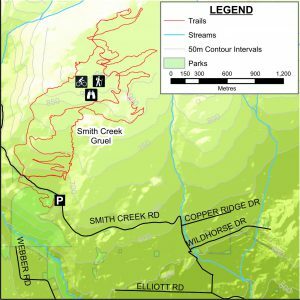 You would turn onto Elliott Rd, follow the meandering road to Smith Creek Road, take a right at Smith Creek Road and follow it up, continuing once you hit the gravel section of road until you hit a small gravel parking area on your left. Some choose to start their ride at the very bottom at Hwy 97 and Elliott Rd, parking along the road or a parking lot. When starting from here, the elevation climb from Hwy 97 & Elliott Rd to Elliott Rd & Smith Creek Rd (the turn off road to access the trail) is approximately 295 feet (90 metres) with the corner of Smith Creek Rd & Elliott Rd to the gravel parking lot adding an additional 400 feet (122 metre) of elevation. 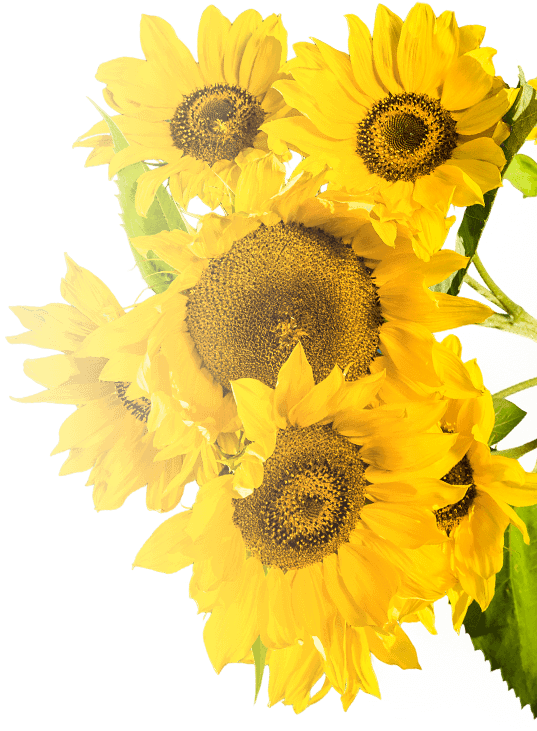 The ride is enjoyable as it will take you past orchards, vineyards, and horses in pastures in a semi-rural setting. About this Trail: There are some beginner trails in the lower elevations and as you go higher so does the fitness level and technical difficulty. Spend anywhere from 1 – 4 hours here, depending on the trail you want to go on. Take care to avoid causing erosion on the many steep slopes. The area is very open and dry, so during the heat of the day make sure you bring lots of water. This area offers a fast flowy descent with jumps, ladders and easy log rides.